We offer flexible ways to study as a postgraduate including part-time options for most of our courses. Our postgraduate courses are practical and relevant to the needs of industry and employers. 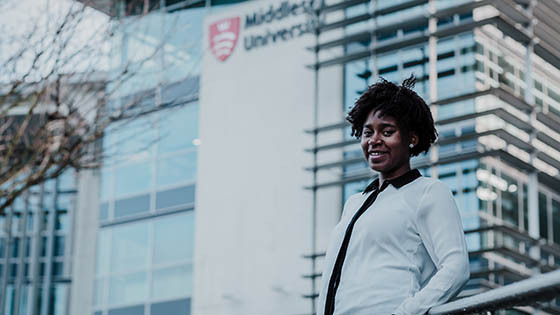 At Middlesex, you'll study in a world-class postgraduate learning environment as part of a global community of liked-minded students and staff. 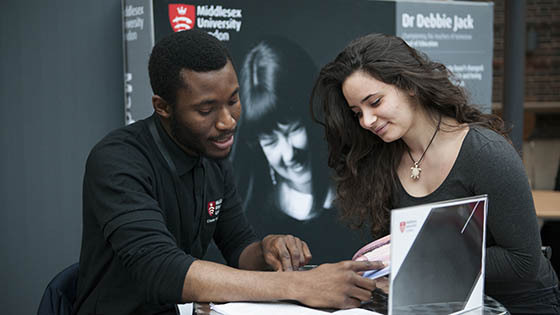 Stay on at Middlesex for postgraduate study to get the best possible start to your career. Our guide to master's for current students. Talk one-to-one with academic staff about our courses and research opportunities. Get expert advice about your application including funding and scholarships. Let our current students show you around our postgraduate learning environment and see our industry standard facilities. Our postgraduate courses will develop your real-world subject knowledge and enhance your professional skills. They are informed by professional practice and industry leading research and taught by international academics and expert practitioners. Meet our academics and support staff, look around our outstanding campus and facilities and start your fast track application to study here. Our postgraduate courses have both general and course specific requirements. We recognise academic achievement, work and other experience when we assess your application to make sure you make the most of studying here. We'll take you to the next level in your career. Our courses are developed with industry to give you specialist skills that meet the needs of employers. You'll get personalised career advice from your application to graduation and beyond and we'll support your business ideas and entrepreneurial talent too. Our application process depends on your course and how you choose to study. The fees for your degree are listed on the individual course page under the Fees and funding tab. Our finance information for postgraduates has more detail about the costs of studying at Middlesex and financial support such as postgraduate loans. Our single-site campus in north London is an exceptional place for postgraduate study. We have invested more than £200 million in industry standard facilities and equipment as well as 24/7 libraries and flexible spaces for private and group study. Following your application, you'll get confirmation that our Admissions team have received it. Then they will contact you in around four to six weeks with a decision. If you have been successful, read your offer letter carefully and contact us if you're not sure about anything. If you have received a conditional offer, please send us the required documents to satisfy the offer conditions as soon as possible. If your application was unsuccessful, you will be notified about an update on your application by email and the Online Applicant Portal. Once you've received an offer from us, you’re part of our community of students, researchers and academics. Find out more about us and what you need to know when you’re choosing where to study your postgraduate course.